We’d love your help. Let us know what’s wrong with this preview of The Fifteen Wonders of Daniel Green by Erica Boyce. To ask other readers questions about The Fifteen Wonders of Daniel Green, please sign up. Sam Barts is a farmer in a small Vermont town, struggling with drought and attracting young people to stay and work the farms. Sam is dying of cancer and in his final months has come up with a plan to give the town an injection of interest and tourism. He's engaged Daniel Green to design a crop circle that he will secretly make under cover of darkness in Sam's cornfield. Daniel is part of a clandestine group that hires themselves out to make crop circles. He has created fourteen before in other Sam Barts is a farmer in a small Vermont town, struggling with drought and attracting young people to stay and work the farms. Sam is dying of cancer and in his final months has come up with a plan to give the town an injection of interest and tourism. He's engaged Daniel Green to design a crop circle that he will secretly make under cover of darkness in Sam's cornfield. Daniel is part of a clandestine group that hires themselves out to make crop circles. He has created fourteen before in other towns, working undercover as a farm hand and then moving on. He has plans for his fifteenth crop circle to be his most intricate yet. Grieving for the recent death of his crop circle partner and girlfriend, Daniel becomes drawn into Sam's family and offers to help his daughter Nessa in her quest to bridge the rift between her father and her absent brother Charlie. This is a story about the healing power of family and community and that sometimes what you are really looking for is right under your nose. A beautiful and engaging debut novel about love and family with an unusual look at the mechanics of making crop circles. The Fifteen Wonders of Daniel Green is a beautiful story of hope and perseverance. Erica Boyce writes with creative, poetic language. This book was so wonderful- so different from what I tend to come across these days. I loved how eccentric the entire story was and the healing and lessons that happened. I feel like I went on a journey with Daniel and Nessa as well as her whole family. It’s a story that won’t soon leave you. What begins as a delightful journey goes deep. All along the way the lan The Fifteen Wonders of Daniel Green is a beautiful story of hope and perseverance. Erica Boyce writes with creative, poetic language. This book was so wonderful- so different from what I tend to come across these days. I loved how eccentric the entire story was and the healing and lessons that happened. I feel like I went on a journey with Daniel and Nessa as well as her whole family. It’s a story that won’t soon leave you. What begins as a delightful journey goes deep. All along the way the language is captivating. When I catch myself contemplating the meaning of life and relationships, I know I'm reading an incredible story. The themes in this book will resonate long into the future. This novel was a very unique read. The author was able to capture my attention on the first page and held on to the very end. So thought provoking, sweet and sad, and oh so many truths that relate to most of our lives. I grew to love Daniel more and more with each chapter. A beautiful story of bravery, humility, failure and forgiveness. Thank you NetGalley, Sourcebooks Landmark and Erica Boyce for the opportunity to read this book in exchange for an impartial review; all opinions are my own. This was such a great, unusual read! I hadn't known what to expect from this novel but I know that I loved its title and the alluring front cover, both of which caught my attention. This sweet and engaging story begins with Daniel Green who has a fascination with crop circles. He, along with other members of a secret organization, travels across the country creating strange works of art that leave communities mystified. But when a dying farmer hires him in a last-ditch effort to bring publicity t This was such a great, unusual read! I hadn't known what to expect from this novel but I know that I loved its title and the alluring front cover, both of which caught my attention. This sweet and engaging story begins with Daniel Green who has a fascination with crop circles. He, along with other members of a secret organization, travels across the country creating strange works of art that leave communities mystified. But when a dying farmer hires him in a last-ditch effort to bring publicity to a small Vermont town, loner Daniel finds himself at odds with his heart. It isn't long before he gets drawn into a family struggling to stitch itself back together, and the consequences change his life forever. “The Fifteen Wonders of Daniel Green” by Erica Boyce explores the unexplainable bonds of family, the everyday wonder of love, and the strange mysteries life provides that help humanity light up the dark. The story is told through multiple viewpoints and peppered with characters’ back-stories. The characters themselves were richly portrayed and the way that their stories were interwoven was a credit to this début author. There were moments of difficulties in the tale when I felt close to most of them, however, for me, there was no recognisable plot to the story, as such. Even so, I still very much enjoyed the novel and I was interested to see whether the crop circle would be finished. The ending was both fulfilling and satisfying. Overall, this was a great read for me and one that I would definitely recommend, especially if you are looking for something a little different! I enjoyed many aspects of the story, especially those related to the crop circles. The ‘circlers’ are based on a real group of people and circle-making is generously weaved into Boyce’s story. Some of the related elements are quite fascinating. The author introduces a number of fractured and flawed characters and successfully works towards reconciling relationships and quieting demons. I did think that the book was too tedious in parts, especially during Daniel and Nessa’s road trip. A good effor I enjoyed many aspects of the story, especially those related to the crop circles. The ‘circlers’ are based on a real group of people and circle-making is generously weaved into Boyce’s story. Some of the related elements are quite fascinating. The author introduces a number of fractured and flawed characters and successfully works towards reconciling relationships and quieting demons. I did think that the book was too tedious in parts, especially during Daniel and Nessa’s road trip. A good effort by Erica Boyce. Thanks to Sourcebook Landmark for the ARC in exchange for my honest review. This book's central theme was unexpected but super enjoyable. The crop circles topic was so unique but it worked well and the relationships that were built out of that were well done. The different points of views that picked up right after each other was also an enjoyable part of the book. Without over explaining, one part that I bookmarked to reread in the future is about the pebble in the shoe. The example is a great explanation and claififier and was an important part to the book. The intens This book's central theme was unexpected but super enjoyable. The crop circles topic was so unique but it worked well and the relationships that were built out of that were well done. The different points of views that picked up right after each other was also an enjoyable part of the book. Without over explaining, one part that I bookmarked to reread in the future is about the pebble in the shoe. The example is a great explanation and claififier and was an important part to the book. The intensity of what happened hooked us readers as well. I liked the small town vibe of this book and respected Sam so much that he kept fighting regardless of how he felt and how others reacted when the challenges became bigger. This book had good relationships and bad relationships between characters and it was good to see how some grew and changed. The parent and child expectations was something that was touched upon more than once and brought up great discussion at Book Club. Nessa and Daniel seemed to be the favorite characters and storyline. One member of book club asked if we thought there should be a sequel that focused more on any relationship and we all decided that no this book is best as a stand alone novel and what was developed is all that is necessary. Daniel Green has spent his adult life making crop circles as part of a secret society that travels the world doing so. When he is hired by a farmer in a small Vermont town to make his 15th circle, his life is changed forever. Great characters and a really satisfying ending make this my new go-to book for people who are looking for a good read to escape their own problems for a while. This book is wonderful. Completely original and fascinating story!! The small town of Munsen, Vermont is in trouble, a land full of collapsing barns and dead fields await Daniel Green who has been requested by a farmer named Sam. In a plan to bring publicity with his mysterious crop circles, Sam thinks it will be enough to get the ‘young folks’ to stick around, maybe create enough interest to bring outsiders in who will stay to help work the farms. At least, that’s his desperate wish! His plan is a ‘circlers dream’, how can Daniel resist? Daniel knows how to blend in and go unnoticed until he gets his job done, undercover. Molly is Sam’s wife, struggling with old shame and fear for her husband, not always thrilled about the prospects and ideas Sam has for their farm, but ‘he has a way of sweeping you into his enthusiasm’, this is his biggest project yet. It’s not the struggling farm alone that she and Sam are facing, there are problems that can swallow them whole. Their son Charlie took off for the West ten years ago, bursting in his skin to be free of small town life and all its confines, to shed his father’s expectations, nay- demands. At odds with his father, not interested in farming, choosing a medical career instead, much more befitting his academic success and plans, he knows he doesn’t fit in. Sam sees his choice as a defection to the life he and Molly worked hard for, as if it isn’t ‘good enough’, but it’s a different truth about himself that Charlie believes is the real cause of their rift. Daughter Nessa is home again, wanting nothing more than to work the farm. She and Daniel draw close to one another and soon, both are revealing their pasts and deepest secrets, a relief after keeping hurts close to their hearts for too long. The very things we are shamed into hiding from the rest of the world. Daniel has been a loner for quite some time now, healing from the wounds of a past relationship, he couldn’t have imagined just how much these strangers and their life struggles will come to mean to him. Nessa may be a bridge that guides him back to his own parents, simply for want of helping her. Is salvation possible? Or is it too late in the game? This is about more than crop circles or farms, it’s about family, love, marriage, illness, fear and hope. It’s how we alienate ourselves and each other simply because of our expectations. Sometimes we assume things about our own loved ones and how they relate to us, running with a fiction that could be wrong. It’s about changing direction and the possibility of staying in one place. These are imperfect people dealing with life altering circumstances. Sometimes the most alien thing is our own feelings. tl; dr: Small farm town uses crop circles to cause a stir. The novel centers around a farming family in Vermont; the dying father hires Daniel to make a crop circle in his fields, as a last act of impact on the town he loves. The characters deal with the tough reality of their present and their past; there is love, loss, beauty, and flaws. This book has some powerful lessons and will give you "the feels" for sure. The characters draw you in; despite the surreal setting of crop circles, it all feels *very* real. I loved many parts of this book; picking o The novel centers around a farming family in Vermont; the dying father hires Daniel to make a crop circle in his fields, as a last act of impact on the town he loves. The characters deal with the tough reality of their present and their past; there is love, loss, beauty, and flaws. This book has some powerful lessons and will give you "the feels" for sure. The characters draw you in; despite the surreal setting of crop circles, it all feels *very* real. What an absolute gem of a book. This story took me a while to get into, I kept reading a few pages at a time and not really connecting with it but I finally sat down today to give it a full hour and I was sucked right into the story. This is one of my favorite kind of novels. There's some plot but really what carries the novel is the rich, layered, 3-dimensional characters. The story is told in rotating chapters from three different characters' points of view. And they all felt real, complicated, and wonderful to me. Nesssa was always like her father, all emotion and action bundled together by translucent skin. She's a cluster of raw nerves shooting pain and joy alike straight to her heart, and it was my job to sheathe them all, to shield her. It was long and wordy in places but by that time, I didn't mind at all because I had grown to love these characters and wanted to spend as much time with them as possible. All the interesting crop circle plotline was icing on this beautiful cake. I appreciate the opportunity to read an advanced digital copy of this book and wish to thank NetGalley and the publisher for that in exchange for an honest review. I also appreciate the impetus to learn more about crop circles and the people (not aliens!) who made them. Yes, I remember back to the 70s when they began to appear and were quite a mystery and a hot news topic. The format of the book was difficult for me. Each chapter was written in the first person by a different person – probably 8 o I appreciate the opportunity to read an advanced digital copy of this book and wish to thank NetGalley and the publisher for that in exchange for an honest review. The format of the book was difficult for me. Each chapter was written in the first person by a different person – probably 8 or 10, in all. And each person not only spoke of the current time (and their feelings), but of the past. The ruminations of each character’s memories certainly served as background information for a particular quirk in the current personality, but quite frankly, overshadowed whatever the plot was. And what was the plot? What was the purpose of the book? Well, we had lies and secrets. We had all sorts of different psychological issues. We had infidelity. We had the obligatory gay issue. We had family “issues” (and non-family “issues”!). The plot was definitely secondary to the issues. There are a lot of 4 and 5* reviews which make me wonder what I missed (besides a plot). The author’s use of the English language was beautiful. Her exploration of love and hope and forgiveness and neighborly help was certainly commendable. Her characters are kind and well meaning. Her explanations of various psychological problems were nicely done. And thankfully, each chapter had a heading of the name of which character was speaking. I was so fortunate to get an Advance Review Copy of this book. It’s a moving story, beautifully told, about family and love and friendship, about a dying town and way of life, and the young man who’s recruited to save them. Pick it up. You’ll be so glad you did. I am only giving this interesting novel 3 stars because several times throughout the book, the story was bogged down with way too many details. However, the necessary details were beautifully written and I could feel the love, the joy, the anguish, the sorrow most keenly, of many of the characters. I felt that the story lagged when the attention was turned to the history of the making of the crop circles, and of the storyline that involved Ray, as well as Daniel's past girlfriend. Thank you to Ne I am only giving this interesting novel 3 stars because several times throughout the book, the story was bogged down with way too many details. However, the necessary details were beautifully written and I could feel the love, the joy, the anguish, the sorrow most keenly, of many of the characters. I felt that the story lagged when the attention was turned to the history of the making of the crop circles, and of the storyline that involved Ray, as well as Daniel's past girlfriend. 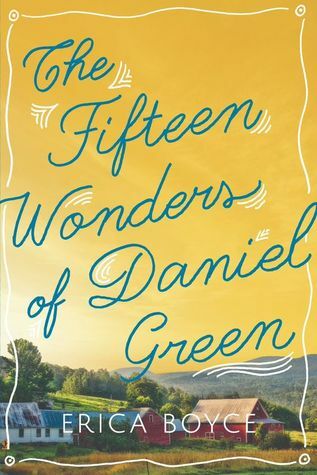 The Fifteen Wonders of Daniel Green is an enchanting and moving novel about beautiful, flawed people in a beautiful, flawed place. Boyce deftly weaves together the threads of half a dozen struggling lives, all within the setting of one small struggling farming town. Boyce is a wonderful, intimate writer, imbuing each page with deepening tension and an emotional resonance reminiscent of the Pulitzer Prize-winning Olive Kitteridge. In a desperate attempt to attract possible future farmers to Munsen, Vermont, dying farmer Sam Barts hires Daniel Green to make a crop circle on his property. Daniel's presence in Sam and Molly's lives is a factor, along with Sam's cancer, in bringing families together, both blood and chosen. Secrets are revealed, old hurts rehashed and somewhat resolved, and love is rediscovered. This was given to me by the fill-in conciliator of the library Book Swap group where we get to pick through ARCs rece In a desperate attempt to attract possible future farmers to Munsen, Vermont, dying farmer Sam Barts hires Daniel Green to make a crop circle on his property. Daniel's presence in Sam and Molly's lives is a factor, along with Sam's cancer, in bringing families together, both blood and chosen. Secrets are revealed, old hurts rehashed and somewhat resolved, and love is rediscovered. This was given to me by the fill-in conciliator of the library Book Swap group where we get to pick through ARCs received by the library and give our opinion, helping them to decide where to spend their money. I thought it was going to be a science fiction or fantasy book as we both like that genre considering it was about crop circles. I wasn't even close. What I found was a heartfelt, strongly character-driven story of people struggling to survive life, to be willing to accept help from others. It is learning to live to your fullest, no matter what your problems might be, from OCD to issues with panic attacks to inability to feel comfortable in large groups or even making wrong choices in love. This was an Advanced Reader's Edition, complete with a writer interview and suggested Reading Group Guide questions. I tend to get picky, even with ARCs, when there are masses of typos and other problems. Didn't find a single one here, so I was never yanked painfully from the story. The publication is scheduled for April. Honestly this would be an excellent book club choice. There is so much to unpack here. As the chapters switch from Daniel to Molly to Nessa in first person narration, there is even more depth to their story, their emotions. This is a story about crop circles – yes, those otherworldly designs that appear in fields of corn or wheat. This plot line provides the basis for a greater story both Daniel Green, the crop circler, and the family he creates it for. This is ultimately a story about family and forgiveness. There’s a bit of symbolism in the design that Daniel creates, where circles intersect and overlap each other, just as the stories overlay and intersect each other. As such, the story is told from multiple poin This is a story about crop circles – yes, those otherworldly designs that appear in fields of corn or wheat. This plot line provides the basis for a greater story both Daniel Green, the crop circler, and the family he creates it for. This is ultimately a story about family and forgiveness. There’s a bit of symbolism in the design that Daniel creates, where circles intersect and overlap each other, just as the stories overlay and intersect each other. As such, the story is told from multiple points of view, primarily by Daniel, Molly (the wife of the farmer who hires Daniel), and Nessa, Molly and Sam’s daughter. Boyce does well to balance the voices so no one story outweighs the other, and she handles the switching of narrators well. I'm so glad that I took a chance on reading an advance copy of this debut novel; I absolutely loved it. It was beautifully written, and I liked everything about it. The crop circles provided a unique plotline, and I enjoyed learning about them. The story dealt with many issues including terminal illness and its effect on the whole family, chronic psychological problems, infidelity, and parent-child relationships. I liked the narration switching among the characters; I think it helped the reader I'm so glad that I took a chance on reading an advance copy of this debut novel; I absolutely loved it. It was beautifully written, and I liked everything about it. The crop circles provided a unique plotline, and I enjoyed learning about them. The story dealt with many issues including terminal illness and its effect on the whole family, chronic psychological problems, infidelity, and parent-child relationships. I liked the narration switching among the characters; I think it helped the reader get into their heads. All of the characters had complex challenges in their lives, and the author made all of them very interesting. She did a great job satisfying my curiosity about what would likely happen to all of them. I appreciated the description of the farming community and how it responded to the family. I also liked seeing the family's reaction to being on the receiving end of help from their neighbors. This is an interesting story about Daniel, a young man who travels around the country doing crop circles for farmers etc. He is about to do his 15th, a significant number in the wider "circlers" group. We find out about Daniel's family, background and life. he comes to do a circle for a farmer in Vermont. He becomes quite close to the farmer's family. We find out about the cancer the farmer is dealing with, his wife's infidelity years before, the father's estrangement from his gay son, and his da This is an interesting story about Daniel, a young man who travels around the country doing crop circles for farmers etc. He is about to do his 15th, a significant number in the wider "circlers" group. We find out about Daniel's family, background and life. he comes to do a circle for a farmer in Vermont. He becomes quite close to the farmer's family. We find out about the cancer the farmer is dealing with, his wife's infidelity years before, the father's estrangement from his gay son, and his daughter's struggle with OCD. Daniel is drawn in and genuinely cares for the family. He goes on a road trip with the daughter to bring the son back. He grows close to her and helps her. He learns that he cares more for the family and farm life than circling. From a sad situation (the cancer) , we find hope for many of the characters. I read this book quickly and really enjoyed the relationships between the characters. I felt for Nessa on so many levels throughout the book and probably identified with her the most. I also felt invested in the marriage of Sam and Molly. Besides Nessa, their marriage was one of my favorite aspects of the story, I love the way the author provided back story on their marriage and the way they loved each other. Boyce did a great job fleshing out each of the characters and make them relatable. The c I read this book quickly and really enjoyed the relationships between the characters. I felt for Nessa on so many levels throughout the book and probably identified with her the most. I also felt invested in the marriage of Sam and Molly. Besides Nessa, their marriage was one of my favorite aspects of the story, I love the way the author provided back story on their marriage and the way they loved each other. Boyce did a great job fleshing out each of the characters and make them relatable. The crop circle aspect was interesting and not something I have ever read about in a book before. I have only heard vague things on conspiracy shows about crop circles, but honestly never thought much about it. This was a touching story about family, grief, marriage, forgiveness and the power of community. It dealt with issues such as alcoholism and mental health. I would recommend it. Whenever you read a book, your perspective of the story and characters are impacted by your own life. For me, the central event, a man dying of cancer asking Daniel to create a crop circle on his farm, hit home a little too much. My wonderful dog is dying of cancer, making the reading of Sam's story a little bittersweet. Additionally, the title is rather misleading. Daniel may be one of the characters in this book, but he is not the only one. Even the chapters are written from different points o Whenever you read a book, your perspective of the story and characters are impacted by your own life. For me, the central event, a man dying of cancer asking Daniel to create a crop circle on his farm, hit home a little too much. My wonderful dog is dying of cancer, making the reading of Sam's story a little bittersweet. Additionally, the title is rather misleading. Daniel may be one of the characters in this book, but he is not the only one. Even the chapters are written from different points of view, featuring the farmer's daughter and his wife. I would even say that the reader learns more about other characters in the book than Daniel. And, this is not a complaint as Ms. Boyce does a touching job of portraying her myriad of characters, each looking for their place. Maybe Daniel's appearance is what helps them find their place and that is his final "wonder?" I love you like a sickness, I think. I love you in my bones. This book had me crying like a little baby. There were times when I had to put my phone down and stop reading because I couldn't take it. My eyes were blurred with tears and I couldn't see anything. I feel like I survived reading this book with only half my soul left. This book dealt with everyday things while introducing new and interesting aspects, which was very fascinating. The characters felt so real and I was hurting for every single one of them. If you're not prepared to love this book with all your heart and also hate yourself for going through all that pain, then don't read this book. The Fifteen Wonders of Daniel Green by Erica Boyce is a free NetGalley ebook that I read in late March. Multiple ongoing stories from different narrators: Daniel Green (who creates custom crop circles for American farmers, musing on people who believe in the circle’s otherworldly origins), Molly (coming to terms with the slow death of her husband, Sam, by cancer, setting aside every one of her other plans), and Vanessa (‘Nessa,’ Molly and Sam’s daughter who’d moved to California, returns often wi The Fifteen Wonders of Daniel Green by Erica Boyce is a free NetGalley ebook that I read in late March. I received this book as an E-ARC from NetGalley in return for an honest review. While I enjoyed the underlying aspects of the story, I did not love this book as much as I hoped. It is a story told from multiple perspectives, and all characters working through inner demons and how they overcome them. Through this storyline there were many heart warming moments of forgiveness and redemption, along with many heartbreaking moments that truly made you feel for the characters. So, while the characters I received this book as an E-ARC from NetGalley in return for an honest review. While I enjoyed the underlying aspects of the story, I did not love this book as much as I hoped. It is a story told from multiple perspectives, and all characters working through inner demons and how they overcome them. Through this storyline there were many heart warming moments of forgiveness and redemption, along with many heartbreaking moments that truly made you feel for the characters. So, while the characters were very dynamic and unique, the overall story did not cut it. There were many dull points and not much action took place. There were many places I lost interest while reading due to the slow moving plot. Despite that, the book was still beautifully written, just not my cup of tea. This is a beautiful book, about community and extended family, falling in love and mourning, and loss and acceptance and joy. Boyce's debut novel showcases her impressive talent. The story is told by a trio of narrators, their experiences touching and overlapping, unique yet connected, weaving together like a spiral of circles pressed into a field of cornstalks. It would be easy for one voice or another to dominate, but they don't. Instead they harmonize and support each other. Small details of This is a beautiful book, about community and extended family, falling in love and mourning, and loss and acceptance and joy. Erica has been writing since she was in third grade. She wrote an illustrated story about an awkward encounter between a Thanksgiving turkey and a hunter and never looked back. Since then, she's written angsty poetry in high school, angsty short stories as an English/Creative Writing major at Dartmouth College, less-angsty legal memos as a student at Harvard Law School, and her first novel, a spec Erica has been writing since she was in third grade. She wrote an illustrated story about an awkward encounter between a Thanksgiving turkey and a hunter and never looked back. Since then, she's written angsty poetry in high school, angsty short stories as an English/Creative Writing major at Dartmouth College, less-angsty legal memos as a student at Harvard Law School, and her first novel, a speculative-ish work of literary fiction entitled THE FIFTEEN WONDERS OF DANIEL GREEN.